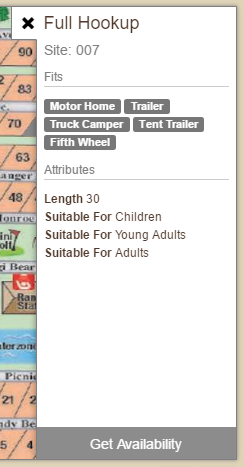 One camping unit per family per site is allowed with the base rate for a family of 2 adults and 3 children under the age of 18. Extra persons are allowed (with Management approval only) for $6 per person per night. 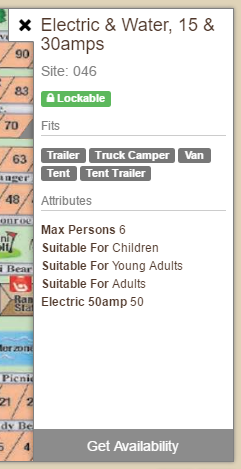 An additional camping unit on a site (tents only) is $32.00/night. A deposit is due at the time of reservation. Credit and Debit cards are accepted. No personal checks. Balance must be paid 30 days prior to your stay or your reservation may be cancelled. All campsites have a 2 night minimum stay during July and August and on weekends. A 3 night minimum stay is required on holidays or holiday weekends. Cancellations 7 days or more prior to arrival date will receive a refund minus a $10 service fee. Cancellations less than 7 days prior to arrival are not eligible for a refund. Check-in begins at 1:00pm for campsites. Check-out is any time before 12 noon. In some instances an early check-in or late check-out may be available. $5.00 non-refundable fee for reserving your site on-line. In order to lock in your site number request there is a $20.00 fee. There are absolutely no refunds on the site locking fee - this includes cancellation of reservations, changing of dates, or dissatisfaction with the site you chose.